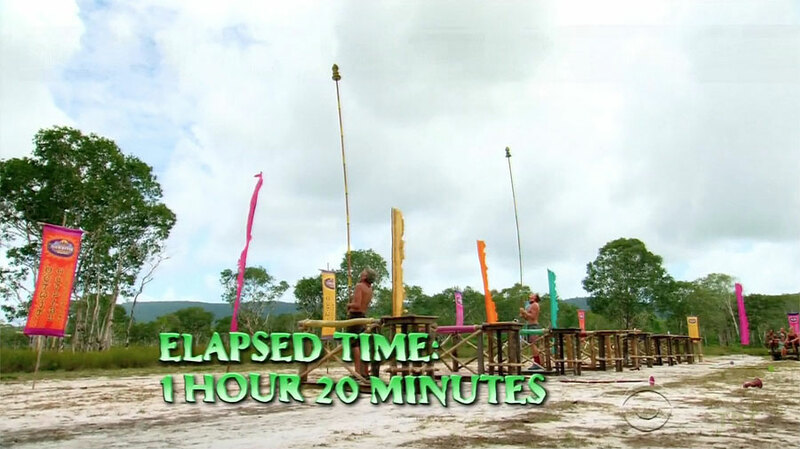 Survivor: Worlds Apart finale aired one week ago. Press begins to arrive in Cambodia. Ep1: "Second Chance" Ep2: "Survivor MacGyver" Ep3: "We Got a Rat"
Arrival: Both tribes must gather items off a large boat, then get to their raft, in a limited amount of time. Kelly Wiglesworth then dives in and starts swimming for a second boat containing rice, while Ta Keo paddles towards it for a while, before Woo dives in. Joe eventually tries swimming too, but Woo reaches the boat first, winning rice for Ta Keo. Then both tribes head to their camps. Filming begins, like "the first season." Lots and lots of yoga. Tribes must jump off a dock, swim to their raft, guide it past a series of woks, lighting them along the way, to and up the beach. One person (Kelly, Spencer; Joe) must then tie sticks together to retrieve a key and open one a gate, before lighting the final wok. Kelly blows a substantial Ta Keo lead as Joe gets the Bayon key quickly. 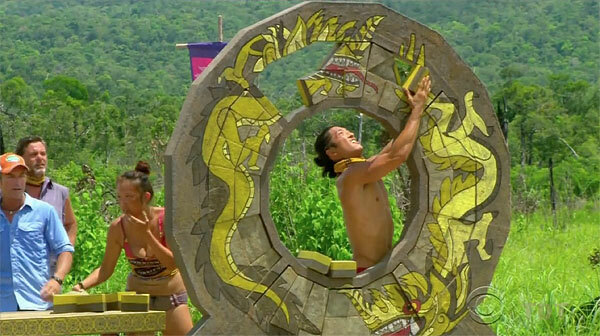 Meanwhile, Kelley grabs the Ta Keo hidden idol, as Kelly tries to get their key. Bayon wins. 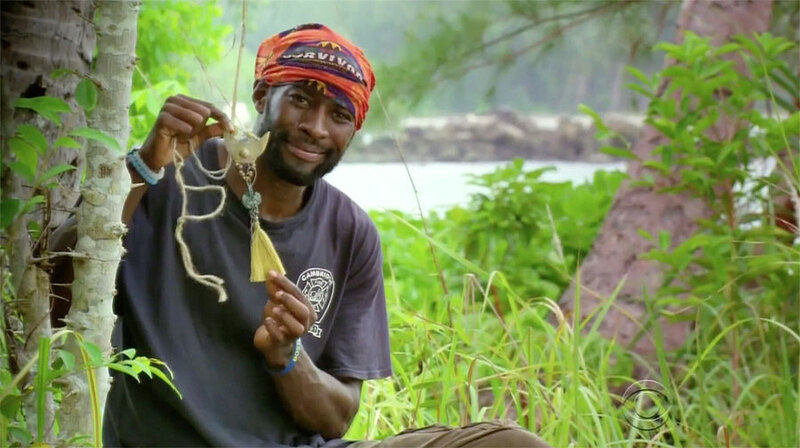 Ep1 RC/IC: "Quest for Fire" - Bayon wins, Kelley finds Ta Keo's iol. Ep2 RC/IC: "Yank Yer Hank" - Bayon wins. TC2 - Shirin voted off (5-4), 18 left. 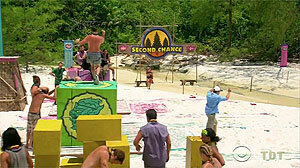 Contestants are told they're being swapped into three tribes, then pick closed boxes containing new buffs. Three new tribes of six (three men, three women) are formed: Bayon, Ta Keo, and Angkor. Ep3 Tribe swap. Shuffle to three tribes, Angkor formed. Ep.3: "We Got A Rat" Ep4: "What's the Beef?" 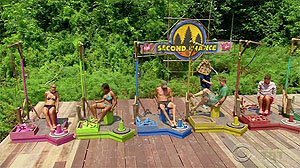 Ep5: "A Snake in the Grass" Ep6: "Bunking With the Devil"
One person (Spencer, Kelley, Woo) uses a pole to collect three keys, unlocking three chests, which the remaining tribe members move on a cart. They then must dismantle the cart to move it through an obstacle, while climbing over the obstacle themselves. They must then cross a debris-strewn field, then two people (Monica,Spencer; Tasha,Peih-Gee; Joe,Kass) open the crates and remove puzzle pieces to complete a vertical circular puzzle (as in Cagayan's Ep1 IC). Jeremy swaps in for Monica on the puzzle; Woo swaps in for Tasha. Ta Keo wins easily, Bayon is second. During the challenge, Jeremy also retrieves Bayon's hidden idol. 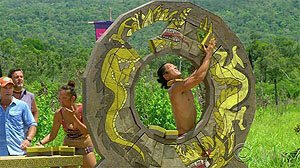 Ep3 RC/IC: "Draggin' the Dragon" - Ta Keo wins, Bayon second; Jeremy finds Bayon's idol. TC3 - Peih-Gee voted off (4-2), 17 left. 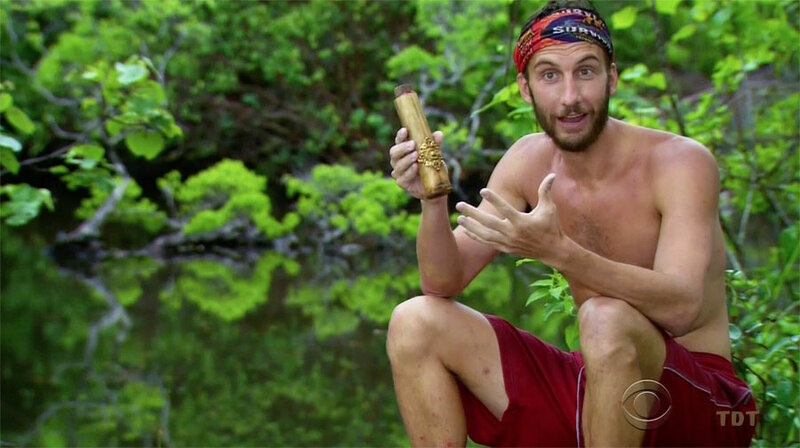 Tribes select one 'hero' to compete on behalf of the entire tribe (Savage, Jeremy, and Terry). That person must race out into knee-to-waist-deep water, retrieve a sandbag, return to the beach, and catapult it into an overhead net. First person to retrieve and land all three bags wins. Savage wins a sausage barbecue for Angkor; Terry wins a smaller BBQ set for Ta Keo. 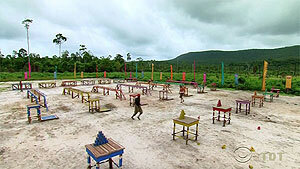 Ep4 RC: "Stompede" - Savage wins BBQ set for Angkor, Terry second for Ta Keo. Ciera and Monica sit out. For the first half, sighted callers (Varner, Kimmi, Kass) direct blindfolded tribemates to collect 16 large puzzle pieces, and return them to the tribe mat. 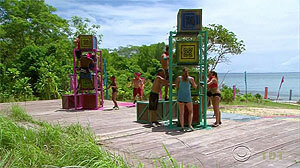 Once all 16 have been retrieved, tribes remove their blindfolds and solve the puzzle. Bayon is first, Ta Keo second. Angkor loses again. 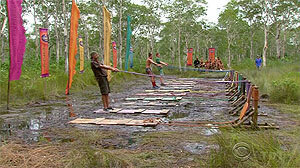 Ep4 IC: "Blind Leading the Blind" - Bayon wins, Ta Keo second. TC4 - Varner voted off (4-1), 16 left. Terry & Kass, Stephen & Wiglesworth all sit out. Barrel riders: Wentworth, Woo, Monica. Woo, Keith, Jeremy do skee-ball leg (6 balls each). Spencer swaps in for Jeremy (after Jeremy has 1 in), immediately sinks 3 more. Keith wins, Woo second, Bayon third with 4 in as the challenge ends. Ta Keo gets comfy chairs, hammocks, fruit, and juices. Angkor gets a tarp. 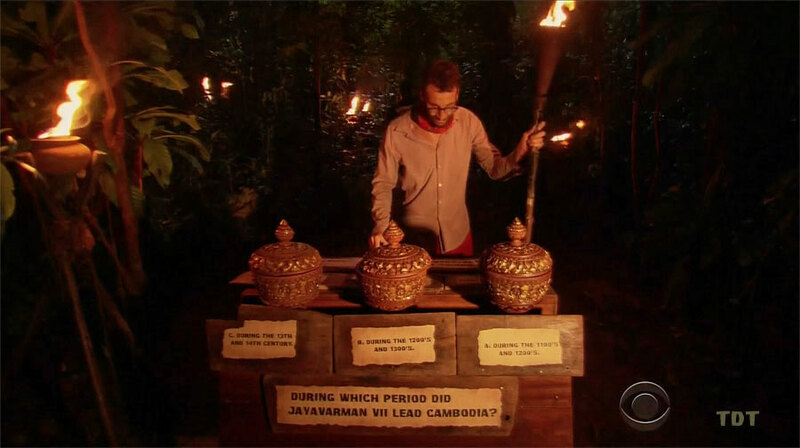 Ep5 RC: "In the Barrel" - Ta Keo wins comfort items; Angkor second, gets a tarp. Ciera & Kelley, Jeremy & Monica sit out. Contestants must cross a set of obstacles, then use a giant slingshot to fling sandbags at distant, flag-raising targets. Shot record: Joe-1(Ta Keo 1), Spencer-1(Bayon 1), Savage-1(Angkor 1), Wiglesworth-1(B2), Woo-1(A2), Stephen-1(hit Angkor's target, A3), Keith-1(TK2), Tasha-1(A4), Terry-1(TK3), Abi-0 and swaps for Woo, Kimmi-0 and swaps for Spencer, Woo-2(A5, Angkor wins); Spencer-2(B3), Kass-0 and swaps for Joe, Joe-2(TK4), Kelly misses and swaps for Spencer, Keith-2(TK5, Ta Keo second). Bayon loses. Ep5 IC: "Air Raid" - Angkor wins, Ta Keo second. TC5 - Monica voted off (3-2-1), 15 left. 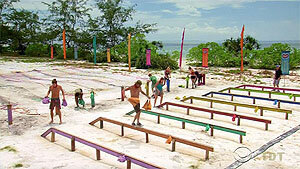 First, the tribes pick new buffs, re-sorting themselves back into the two original tribes, Ta Keo and Bayon. Then they compete in Slip, Slide & Score. 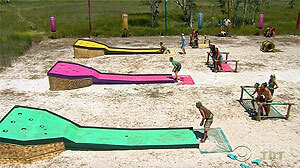 Contestants compete head-to-head against an opponent from the other tribe. As in One World, they must slide down a ramp, pick up a ring, then toss it onto a pole. First to land their ring wins a point for their tribe, first tribe to 3 (as shown) wins. Scoring: Jeremy d. Savage by a split second (B-1). Kass d Stephen (TK-1, B-1). Abi d. Kimmi (after Abi almost walks off, TK-1, B-2). Joe d. Woo (TK-2, B-2). Kelly d. Kelley (TK-3, B-2). Ta Keo wins a Survivor picnic delivered to their camp. Not shown competing: Tasha, Keith, Ciera, Spencer. 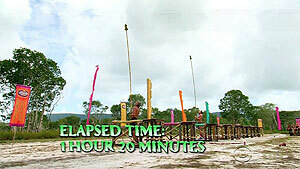 Ep6 RC: "Slip, Slide & Score" - Ta Keo wins a feast. Ep6: "Bunking With the Devil" Ep7: "Play to Win" Ep8: "You Call, We'll Haul"
(Gross food challenge.) 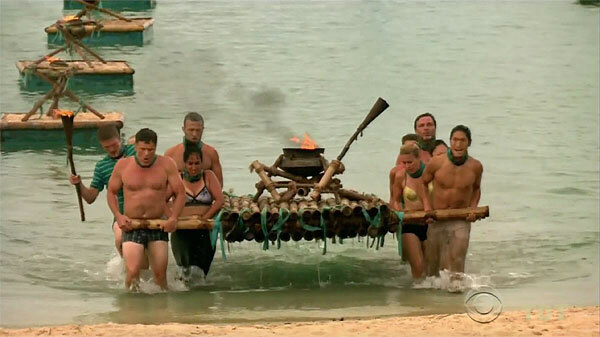 Initial rounds are done with pairs of contestants from each tribe, first tribe where both people finish wins a point. Apparently playing to four points total. Scoring: Rd.1: Tasha/Kimmi v. Woo/Spencer (tarantulas) - finishers: 1.Spencer, 2.Woo (Ta Keo-1). Rd.2: Ciera/Savage v. Jeremy/Keith (giant water beetle) - finishers: 1.Jeremy, 2.Savage, 3. Keith (TK-1, Bayon-1). Rd.3: Stephen/Kelley v. Kass/Abi (pig snout) - finishers: 1.Stephen, 2.Abi, 3.Kelley (TK-1, B-2). Rd.4: Kelly v Joe (deep-fried frog) - Kelly wins (TK-2, B-2). Rd.5: Woo v. Kimmi (brain) - Kimmi declines, Woo wins (TK-3, B-2). Rd.6: Ciera v Kelley (scorpion) - Kelley wins (Tk-3, B-3). Rd.7: Kass v. Tasha (balut) - Tasha wins (TK-3, B-4). Bayon wins. 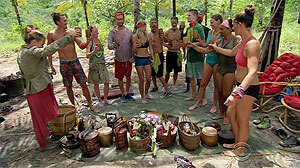 Ep6 IC: "Cambodian Catering" - Bayon wins. TC6 - Woo voted off (4-3), 13 left. Ta Keo and Bayon are sent treemail instructing them to meet at the end of Bayon's beach (and for Ta Keo to bring their stuff). Then they are told they've merged, are given new orange buffs, and they feast at Bayon camp. 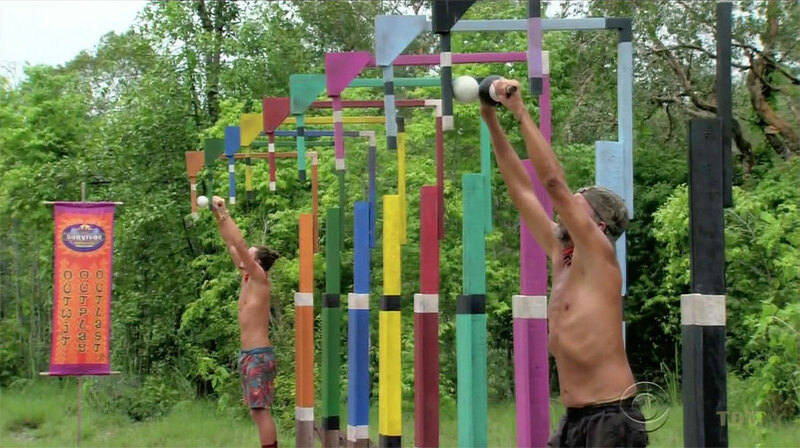 They select the name 'Orkun' for the merge tribe (not shown in the episode). First merge at 13 players remaining. As seen in Cagayan. 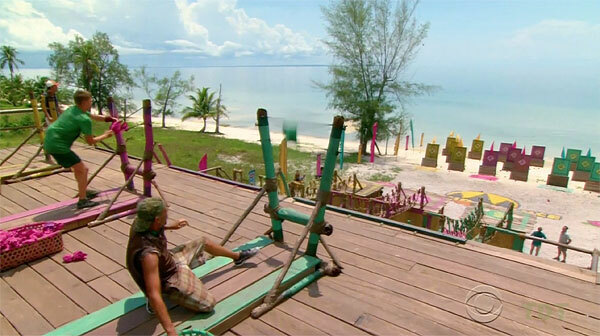 Contestants must balance a ball on a plate held up by a pole, while balancing on a narrow, sloping plank. After 10 minutes, they move to a narrower plank and to a lower position on the pole. After 20 minutes, to the narrowest plank/lowest pole position. Last person standing wins. Order of elimination: Round 1: 13.Stephen (in seconds), 12.Keith (9 min), 11.Ciera, 10.Kimmi. Round 2: 9.Abi (1 sec), 8.Kass (early), 7.Wiglesworth, 6.Wentworth. Round 3 (narrowest): 5.Savage (seconds), 4.Tasha, 3.Jeremy, 2.Spencer, 1.Joe wins! Ep7 IC: "Hard to Handle" - Joe wins. As seen in Blood vs. Water. 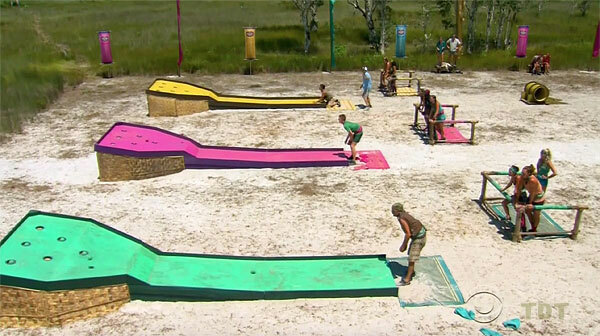 Contestants schoolyard pick (unshown) into two teams: Green (Wentworth, Kimmi, Wiglesworth, Joe, Keith, Ciera) and Purple (Tasha, Savage, Spencer, Jeremy, Stephen, Abi). They must paddle out in a boat, untie and haul onto their boat four large cubes, then return to shore and stack those cubes so that when rotated, each face of the stack has no repeating colors. Green wins a trip to the Tuk-Tuk Cafe, where they gorge on carbs and coffee, and are driven around by Keith in a tuk-tuk. Ep8 RC: "Boats, Brains & Brawn" - Ciera, Joe, Keith, Kelley, Kelly, and Kimmi win. As seen in San Juan del Sur. Contestants must balance a ball on a disc held up by two ropes. In the second and third stages, after 10 minutes, they move further away and use longer grips on the ropes. In the final stage, they are in the farthest position, with two balls. Last person to not drop their ball(s) wins. Elimination order - First stage: 12. Wentworth (in seconds), 11.Ciera (right after Kelley), 10.Wiglesworth, 9.Jeremy, 8.Abi, 7.Stephen, 6.Savage. Second position (10 min): 5.Kimmi, 4.Tasha. Third position (farthest, 10 min): 3.Spencer. Fourth (farthest, two balls): 2.Keith, 1. Joe wins again! Ep8 IC: "Take the Reins" - Joe wins. TC8 - Savage idoled out (-3), 11 left. Ep9: "Witches Coven" Ep10: "Like Selling Your Soul to the Devil" Ep11: "My Wheels Are Spinning"
As seen in Cagayan. Abi not picked, sits out. 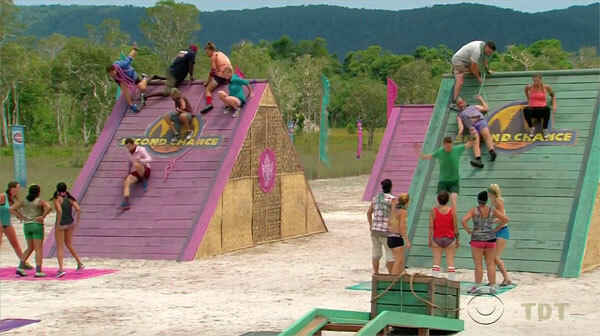 Green team (Kelley, Kelly, Kimmi, Jeremy, Keith) vs. Purple team (Joe, Stephen, Spencer, Ciera, Tasha). Pole ladder puzzle, then a crawl. One person (Joe, Jeremy) must move a key along a rope through sticks, then two people (Ciera, Spencer; ?,?) solve a plank puzzle that gives a combo for a lock. Purple starts their combo puzzle before green even puts ladder together. Purple gets a spa trip. 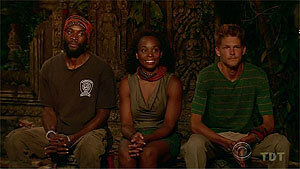 Ep9 RC: "Styx" - Ciera, Joe, Spencer, Stephen, and Tasha win. While the reward winners are away, Jeremy sneaks off and finds the idol clue in camp, which directs him to hike to the end of the beach after dark. After waiting for everyone to fall asleep, he does so, and Jeremy's idol is hanging on a string in the jungle next to a lit torch, giving him two hidden idols. As seen in Caramoan, Cagayan. First round (10 minutes), everyone must balance on a lower rail. Second round (20 minutes) on the top rail. Final round (to the end) top rail on one foot. But first (in the first round), 11.Spencer and 10.Stephen jump and race to a buoy for advantage. Stephen wins. The rest last 10 minutes, finish 1st round. On transition to Rd.2 (top rail), 9.Wentworth, 8.Jeremy, 7.Ciera, 6.Kimmi, 5.Tasha all fall. Rd.2 (10 min in) 4.Keith. Final round (one foot): 3.Wiglesworth on transition, 2.Abi, 1.Joe wins his third IC in a row! Ep9 IC: "Bermuda Triangles" - Joe wins. After winning it at the IC, Stephen opens his advantage in private. It tells him he can play his advantage at Tribal before the vote. He can prevent one person from voting, while getting to vote two times himself. TC9 - Kelly voted off (6-3-2), 10 left. Two teams: Purple (Joe, Spencer, Tasha, Abi, Ciera) vs. Green (Kelley, Kimmi, Stephen, Jeremy, Keith). As in Tocantins, One World. Scoring: Rd1. (Joe,Spencer,Ciera v. Jeremy,Stephen,Kelley): Jeremy (G1). Rd2. (Joe,Tasha,Abi v. Keith,Kimmi,Kelley): Joe (G1, P1). Rd3. (Joe,Spencer,Ciera v. Jeremy,Stephen,Kimmi): Spencer (G1, P2). Rd4. (Joe,Tasha,Abi v. Jeremy,Kelley,Kimmi): Tasha (G1, P3). Purple wins, 3-1, gets village visit with a Cambodian circus, feast, being dry. Ep10 RC: "Basket Brawl" - Joe, Ciera, Spencer, Tasha, Abi win a Cambodian circus trip. Rock dilemma (black rock = playing, white rock = sitting out for improved shelter): Everyone sits out, easily clearing the 5-person minimum, except for Joe and Keith. Challenge: Stand on one foot on a small block of wood, while balancing a ball against an overhanging piece of wood, as in San Juan del Sur. Just Joe and Keith competing. Joe wins, duh. Ep10 IC: "Ballin' A Jack" - Joe wins. Individual. Contestants must listen to a long Probstian story, run to stations, answer a question, take a wrapped medallion from the urn corresponding to the answer they chose, then run back to their stand, and unwrap the medallion. If correct, medallion is gold, if not, wood. Collect 5 for the win. Totals: 1.Stephen 5, 2.Spencer 5 (seconds behind Stephen), 3.Abi 4, 4-tie:Kelley 3, Tasha 3, Jeremy 3, Keith 3, 8.Joe 2, 9.Kimmi 1. Stephen wins, selects Tasha and Jeremy to join him on a helicopter trip to a spa the next morning. Meanwhile, Kelley finds an idol clue hidden in one of her medallion wrappers. 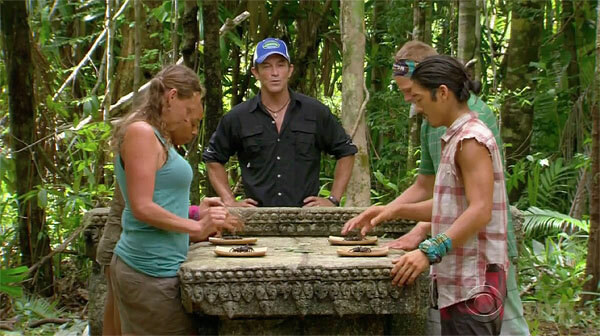 After receiving a clue with one of her medallions at the RC, Kelley finds an opportunity to retrieve the idol from directly under the shelter. It's her second idol found this season. 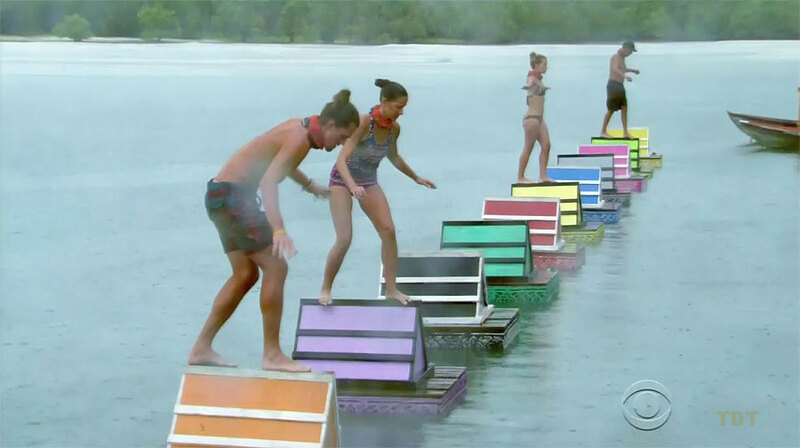 Ep11: "My Wheels Are Spinning" Ep12: "Tiny Little Shanks to the Heart" Ep13: "Villains Have More Fun"
Also as in San Juan del Sur: Assemble a three-tier stack of blocks using just your feet, then place a flag in the middle. Order of finish: 1.Spencer, 2.Joe (6+ blocks), 3. Kelley (6 blocks), 4.Keith (4), 5.Abi (3 blocks) , tie-6th: Tasha,Kimmi (one block each on top row), second row: 8.Stephen, 9.Jeremy. Joe doesn't win! Ep11 IC: "The Game Is Afoot" - Spencer wins. TC11 - Stephen voted off (4-3-2), 8 left. Challenge is performed with loved ones looking on from the sidelines. Contestants must dig up three bags along a rope, spin around a pole to release a fourth bag, then cross a balance beam and untie one more. They then remove the letter blocks to spell a single word (NOURISHMENT). Kelley wins, is the only person to correctly start her word. Kimmi fails to cross the balance beam. Kelley wins barbecue in camp with her loved one (her dad and SJdS castmate, Dale). She picks Kimmi (and her dad), Joe (and his dad), Keith (and his wife) and Abi (and her mom) to join her. 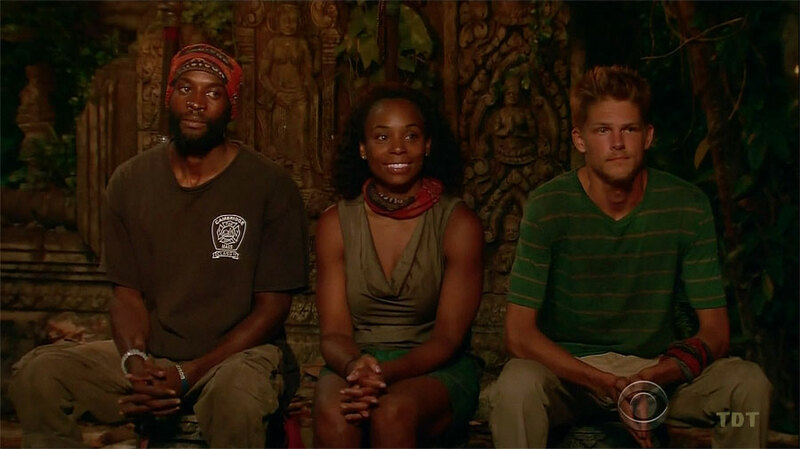 Ep12 RC: "Jungle Love" (loved ones) - Kelley wins. 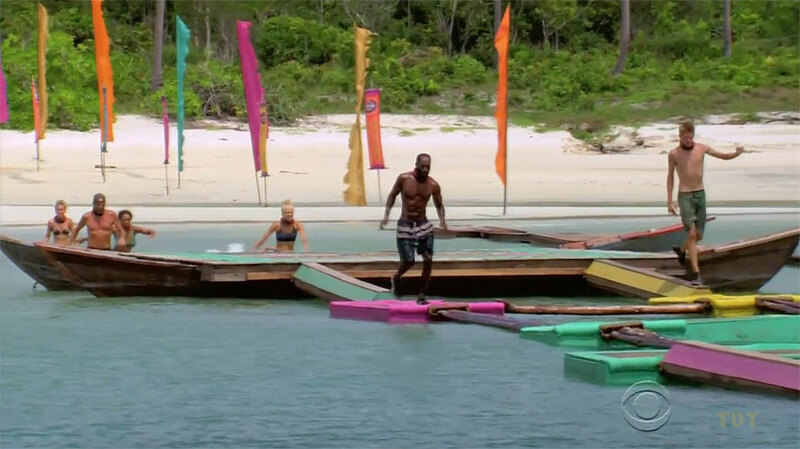 Probst reveals one man and one woman will win immunity. 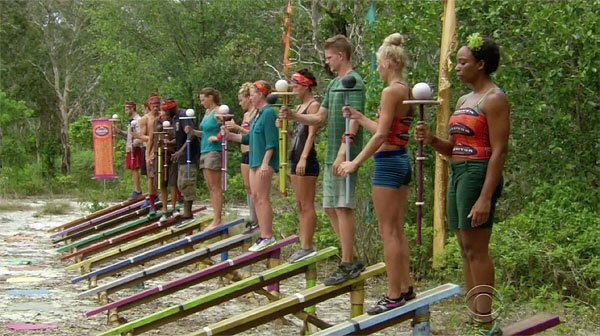 Contestants must balance a wooden statue on a platform at the end of a pole. Every 5 minutes, another 2-foot section of pole is added to the bottom. At 20 minutes, F4.Kimmi and F3.Abi are out. At 25 minutes, F2.Tasha is out, so F1.Kelley wins for women. Then M4.Spencer and M3.Jeremy are out. Keith and Joe add their last pole sections, making their poles 14 feet long, but both remain in until 1 hour, 20 minutes. Then M2.Joe passes out, making M1.Keith the winner for men. Probst calls in medical to tend to Joe, who stays in the game. Ep12 IC: "Over Extended" - Kelley and Keith win. Contestants are attached to a long rope, and must unwind from around a circular fence, bring the rope with them, cross a bridge (placing the rungs as they go), then toss sandbags to knock a tower of blocks off of a table. Keith, Spencer, have early leads, then Tasha, Jeremy, Kelley reach tossing stage. Finish: 1.Keith, 2.Jeremy (2 blocks knocked off), 3-tie:Tasha,Spencer,Kelley (throwing sandbags but no blocks knocked off), 6.Kimmi,7.Abi. Keith wins overnight reward trip to Siem Reap, takes Kelley and Spencer. Ep13 RC: "Pole Dancing"- Keith wins. As seen in Cook Islands. 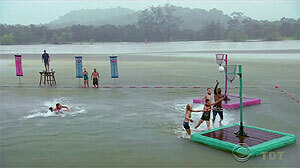 Contestants must race on foot across a series of docks and floating obstacles, dive to retrieve a key, then run back to shore. The key unlocks the unused 5-piece tangram puzzle from the Ep1 RC/IC in Worlds Apart. 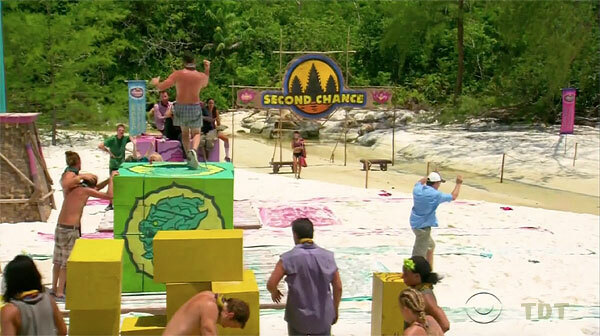 Jeremy and Spencer are the first two to reach the puzzle table, and Spencer solves the puzzle on the first try. Finish order: 1.Spencer wins immunity, 2.Jeremy, 3.Keith, 4.Kelley, 5.Abi, 6.Kimmi. 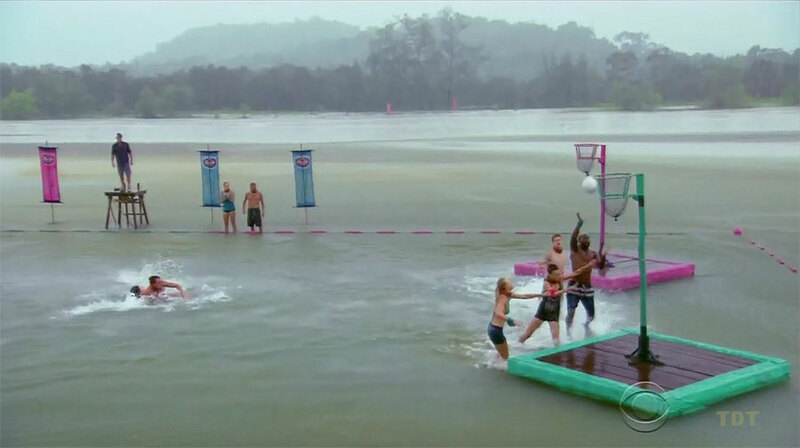 7.Tasha needs to be rescued from the water by the safety swimmers. 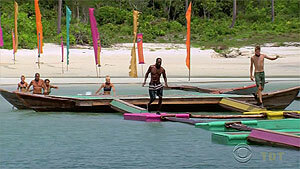 Ep13 IC: "Flotsam Jetsam" - Spencer wins. TC13 - Abi voted off (4-2-1), 6 left. As seen in Redemption Island. 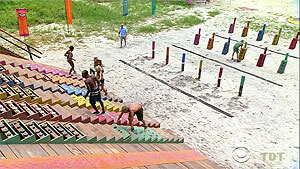 Contestants must untie three sections of stair planks with specific hole patterns, and place them on a staircase, in order, from bottom to top. Once at the top, they must solve a 3-D slide puzzle. Spencer is first to the top, then Kelley, Jeremy, Keith, Tasha, Kimmi. 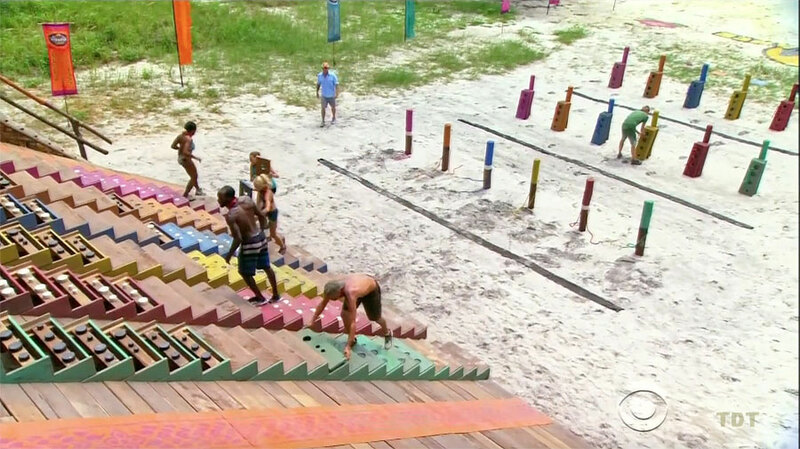 Spencer solves the slide puzzle first, wins immunity. Unclear how the others finished, since it's a slide puzzle. Ep14 F6 IC: "Step On Up" - Spencer wins. TC14 - Kimmi idoled out, [0-0, (3-3)], 5 left. As seen in Tocantins, South Pacific, San Juan del Sur. 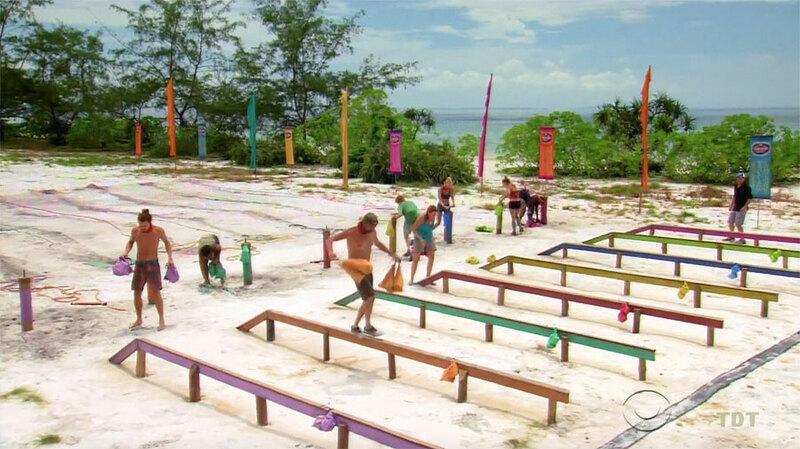 Contestants must race across a net to retrieve one of six puzzle bags, cross a variety of obstacles, and return the bag across the net to a puzzle table. When all six bags are back, they must use the pieces to solve a spin puzzle. Kelley is the first to six bags, then Jeremy, Keith, Spencer, and Tasha. Final number of pieces placed: 1.Kelley-8, 2.Keith-7, 3.Jeremy-4, 4.Tasha-2, 5.Spencer-0. Kelley wins immunity. Ep14 F5 IC: "Giant Tick" - Kelley wins. As seen in Tocantins. 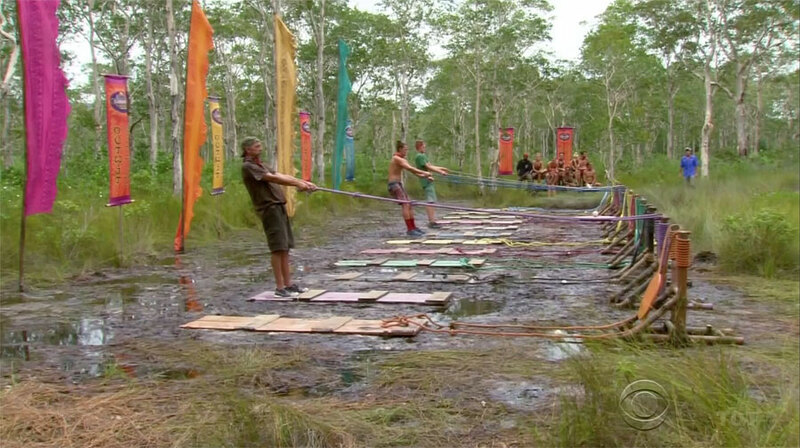 Contestants must place a ball at the top of a twisty track, then catch it when it drops out the bottom, with one hand tied behind their back. As the challenge proceeds, additional balls are added at specific intervals. If a contestant drops a ball, they are out. 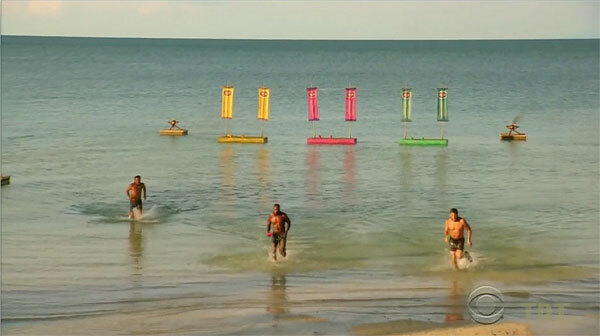 Order of elimination: 4.Kelley (4 balls), 3.Tasha (4 balls), 2.Spencer (5 balls), 1.Jeremy wins immunity. Ep14 F4 IC: "Simmotion" - Jeremy wins. TC16 - Kelley voted off (3-1), 3 left. The jury votes on the final three. Jeremy wins, 10-0-0. TC17: Final Tribal Council and jury vote on the Final Three. Approximate arrival back in the U.S..